Amica Insurance’s corporate communications team was recently honored as part of the Horizon Interactive Awards, a leading international interactive media awards competition. 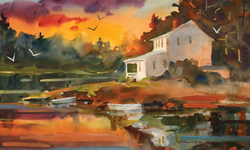 A painting by 97-year-old Al Albrektson, of West Warwick, Rhode Island, was featured on the cover of Amica Insurance’s 2016 Thanksgiving card, which was mailed to more than 800,000 customers. The team earned a Best of Category Award for the 2016 Thanksgiving ecard in the Email/Ecard category. The 2016 Thanksgiving print card was also recognized with a Gold Award in the Print Advertisement/Promotional category. The 15th annual international competition saw more than 1,200 entries from around the world, including 40 U.S. states and 20 countries. An international panel of judges, consisting of industry professionals with diverse backgrounds, evaluated categories ranging from online advertising to mobile applications. The 2016 winning entries showcase the industry’s best interactive media solutions, including websites, mobile applications, print media, interactive displays, public exhibits, online advertising, video, email and more. In its 15th year, the Horizon Interactive Awards was created to recognize excellence in interactive media production worldwide. Since 2001, the competition has received tens of thousands of entries from many countries around the world and nearly all 50 U.S. states. Each year, those entries are narrowed down to the “best of the best” to be recognized and promoted on an international stage for their excellence. The judging process involves a blend of the Horizon Interactive Awards advisory panel, an end user panel and an international panel of volunteer judges consisting of industry professionals. Winning entries have been dubbed the “best of the best” in the interactive media industry.